The Lemhi Shoshone are a tribe of Northern Shoshone, called the Akaitikka, Agaidika, or "Eaters of Salmon". The name "Lemhi" comes from Fort Lemhi, a Mormon mission to this group. They traditionally lived in the Lemhi River Valley and along the upper Salmon River in Idaho. Bands were very fluid and nomadic, and they often interacted with and intermarried other bands of Shoshone and other tribes, such as the Bannock. Today most of them are enrolled in the Shoshone-Bannock Tribes of the Fort Hall Reservation of Idaho. The Akaitikka are Numic speakers, speaking the Shoshone language. Fishing is an important source of food, and salmon, and trout were staples. Gooseberries and camas root, Camassia quamash are traditional vegetable foods for the Lemhi Shoshone. In the 19th century, buffalo hunting provided meat, furs, hides, and other materials. During the 19th century, the Lemhi Shoshone were allied with the Flatheads and enemies of the Blackfeet. The Lewis and Clark Expedition encountered the Lemhi at the Three Forks of the Missouri River in 1805. In the 1860s, Indian agents estimated the Lemhi population, which included Shoshone, Bannock, and Tukudeka (Sheepeaters), to be 1,200. Tendoy was a prominent Lemhi chief in the mid-19th century. He was half-Shoshone and half-Bannock. He became the Lemhi's leading chief in 1863 after Tio-van-du-ah was killed in Bannock County, Idaho. The Lemhi Reservation, located along the Lemhi River, west of the Bitterroot Range and north of the Lemhi Range was created in 1875 and terminated in 1907. Most of the residents were moved to the Fort Hall Indian Reservation. Others remain near Salmon, Idaho. Robert Harry Lowie studied the band and published The Northern Shoshone, a monograph about them in 1909. Wikimedia Commons has media related to Lemhi. ^ David Lester Crowder (1969). Tendoy, chief of the Lemhis. Caxton Printers. Retrieved 16 February 2012. ^ Brigham D. Madsen (1 January 1980). The Lemhi: Sacajawea's people. Caxton Press. ISBN 978-0-87004-267-6. Retrieved 16 February 2012. ^ John W. W. Mann (1 November 2004). Sacajawea's people: the Lemhi Shoshones and the Salmon River country. U of Nebraska Press. ISBN 978-0-8032-3241-9. Retrieved 16 February 2012. Murphy, Robert F. and Yolanda Murphy. 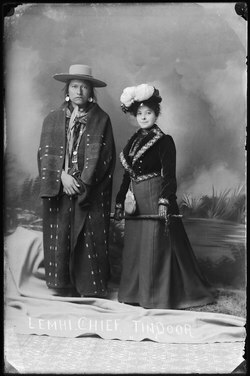 "Northern Shoshone and Bannock." Warren L. D'Azevedo, vol. ed. Handbook of North American Indians, Volume 11: Great Basin. Washington, DC: Smithsonian Institution, 1986. ISBN 978-0-16-004581-3. Madsen, Brigham D. "The Lemhi: Sacajawea's People." The Caxton Printers, Ltd. Caldwell, Idaho 83605, 1979. ISBN 0-87004-267-X. This page was last edited on 6 February 2019, at 18:55 (UTC).